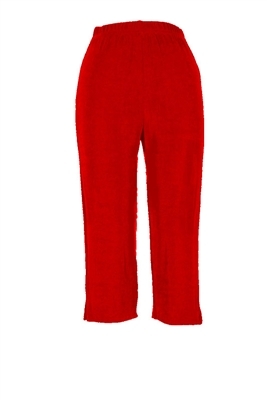 Essential capri pant - must have! This is the more cropped capri, but we also have the longer ankle length capri pant as well. Looks great with coordinating tank top, short sleeve top and/or jacket. Elasticated waistband for comfort. These sizes are approximate and were measured flat, with no stretching. Another 10-12 inches can be added when stretched! Small= 26" waist, 17.5" inseam medium=28" waist, 18" inseam large= 30" waist, 18.5" inseam xl = 32" waist, 19" inseam 90% acetate/10% spandex. Hand or machine wash in cold water. No need to iron because it doesn't wrinkle! Made in USA.